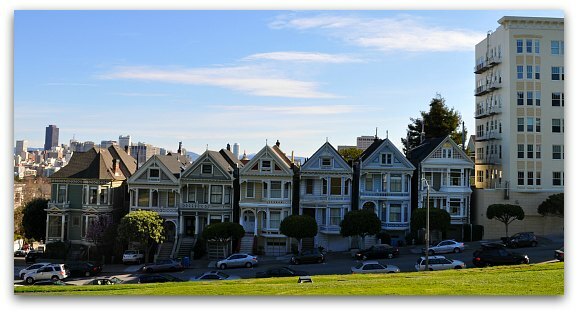 Alamo Square in San Francisco is a beautiful and centrally located neighborhood that is home to the famous "Painted Ladies" or "Seven Sisters." They are a group of seven similar, colorfully painted Victorians that sit right along this district's popular park. You will also hear this row of houses called "Postcard Row." This district lies just to the west of Hayes Valley. The centerpiece of this SF neighborhood is the park, which is bordered by Fulton, Steiner, Scott, and Hayes Streets. You will see many other beautiful Victorian-style houses around the park and throughout the neighborhood too. You wouldn't know it now, but this used to be a suburb. Back in the 1850s, the land was just sand dunes. However, when a group of wealthy businessmen wanted to move further away from the city, they selected this area as their new home. Development in this San Francisco neighborhood boomed from the 1870s to the 1890s. Residents built a variety of Victorian houses, from the well-known Queen Anne style to the more modest Stick style. The ground in this area is more stable than in most other neighborhoods in the city, so the 1906 earthquake did not destroy very many Victorians here. In the 1960s, owners began to revitalize the houses in this district. They began to rehab their houses and paint them with lively colors. Locals and tourists alike loved them and began to visit them frequently. You will also see the outside of them featured in several movies and TV shows. The most famous Victorian Painted Ladies in San Francisco are across from the park on Steiner Street. The addresses for them are 710–720 Steiner Street. These seven beauties line up side-by-side for a picture-perfect scene. They are known as the "Seven Sisters. This set of Painted Ladies stands out because they are all similar (except the largest one on the far left) and have a beautiful view of downtown behind them. During your visit, walk up Hayes Street about a block to Pierce Street to get that perfect picture. You may recognize this famous image from the TV series "Full House." The houses are all privately owned, so you are not able to go inside for a visit. However, you can spend all the time you want admiring them from the street or the park across the street. Please be respectful to the owners and do not try to visit the properties. What is the definition of a painted lady? 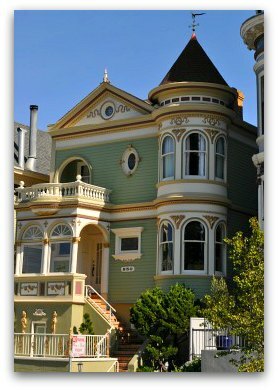 Any Victorian or Edwardian home with three or more paint colors is considered a painted lady, so even though the Seven Sisters on Steiner Street are the most famous, there are several more in the neighborhood to enjoy. 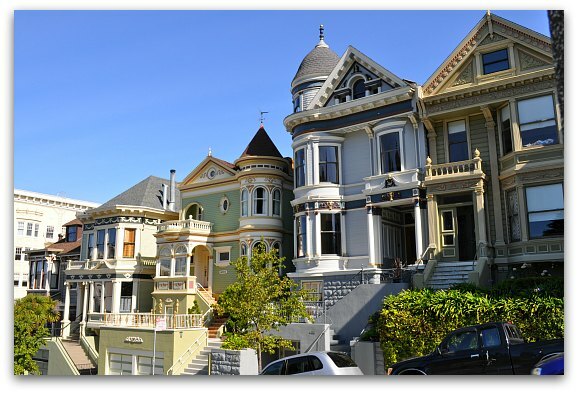 In addition, you will also find gorgeous Painted Ladies in San Francisco in other districts too. You will find a large concentration in the Haight-Ashbury, the Lower Haight, and Pacific Heights. After walking around the neighborhood, the park is the perfect place for a picnic lunch. You can sit facing the Seven Sisters and enjoy a great view of downtown San Francisco. On a sunny day in the city, this is one of the most beautiful places to visit. Here is the map of the Painted Ladies along Alamo Square Park. The star shows you where the Seven Sisters are located. 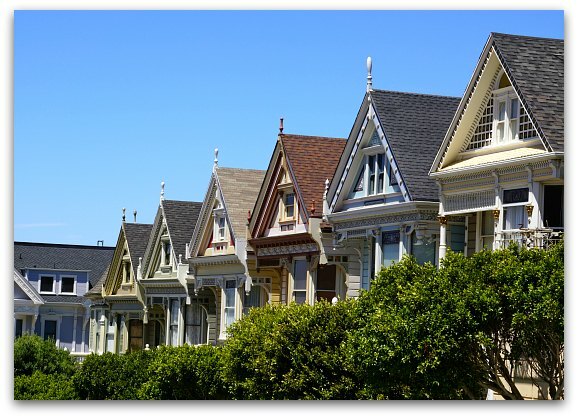 INSIDER'S TIP: These famous Painted Ladies face west. The sun shines on them in the afternoon, so this is the best time to get your pictures. 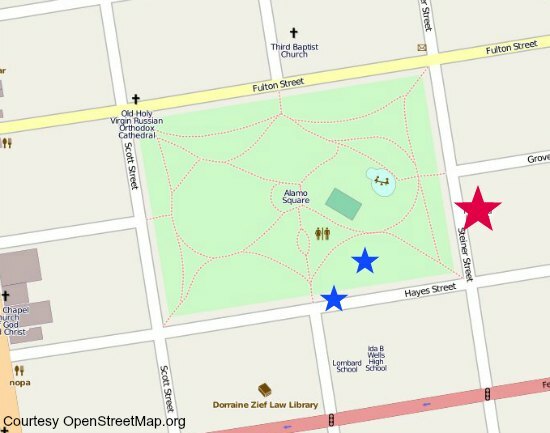 The blue stars on the map show the best locations for taking photos. This is what they look like when you photograph the Painted Ladies San Francisco in the morning. You can see that the colors don't pop as the front is all in the shade. The rest of the photos on this page of these Seven Sisters were taken in the afternoon after around 1pm. 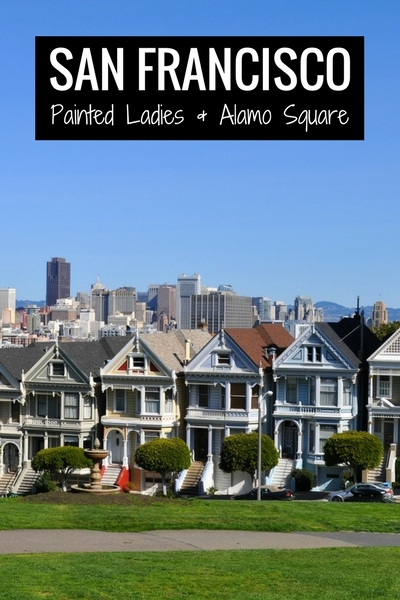 These are a few guided tours that include the Painted Ladies of Alamo Square. Some are dedicated to this district, while others will take you near the Seven Sisters for a closer look. 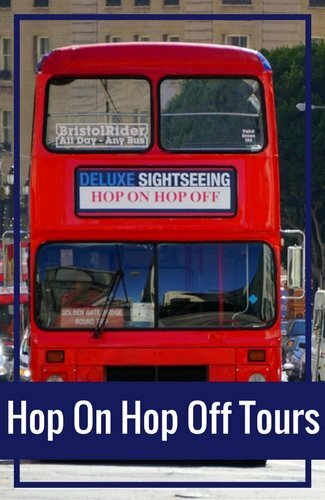 Hop On Hop Off Bus: The Hop On Hop Off Bus is a great way to get here. The City Sightseeing buses offer several stops and one of them is a few blocks away from these Painted Ladies. You can learn all about them before you hop off and then enjoy them for as long as you want. Find out more about their options here. Electric Bike Tour: On this four-hour guided electric bike tour, you will cruise through top districts and past some of the best San Francisco attractions. Along the way, you will cruise past the Seven Sisters and learn more about them from your knowledgeable guide. 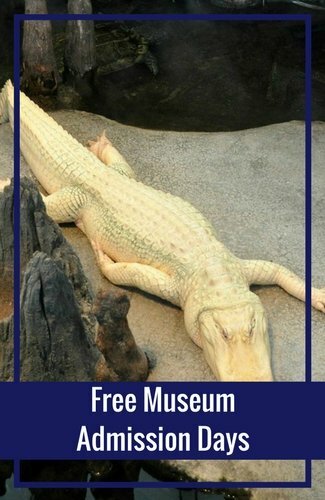 Find out more about this tour here on Viator. 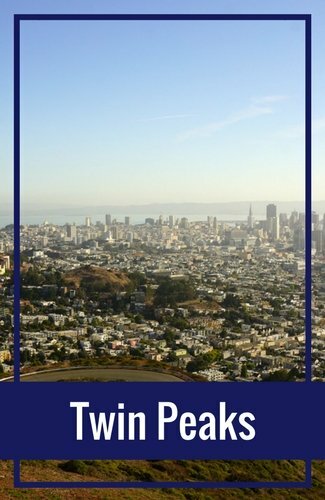 A Perfect Day in Civic Center & Alamo Square: This self-guided tour offers you the chance to visit both of these neighborhoods in just one day. This easy-to-follow route includes morning visits to the Asian Art Museum and City Hall. 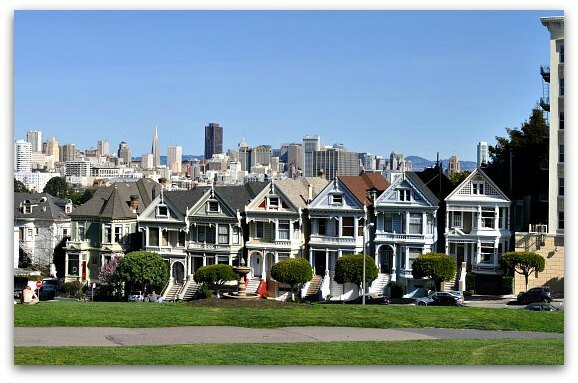 You will then grab some lunch and get an afternoon view of the Painted Ladies of Alamo Square. It's a fun way to spend the day and see all of the best sites these two districts have to offer. Landmark Victorians Of Alamo Square: The best walking tour of this district is this free walk organized by the public library. During this two-hour walk, you will get up close and personal with many of the colorful Victorians. You will walk up a few hills and through the park as you learn more about some of the most interesting houses. If you are lucky, you might even get the chance to see the inside of one of the remodeled Victorians. Find the schedule for this walking tour and other free tours offered by the SF Public Library. Alamo Square probably looks familiar even if you haven't been here in person. It's been features in dozens of movies and TV shows throughout the years. Here are just a few of the most famous ones. Full House (1987-1995): I've mentioned this one a few times already and this TV series made this area even more famous. Although the Seven Sisters were featured in the opening credits for this show, the house they "lived" in was in Pacific Heights. They only filmed outside of these houses, but the outside of them were featured prominently in the show for all 9 seasons. 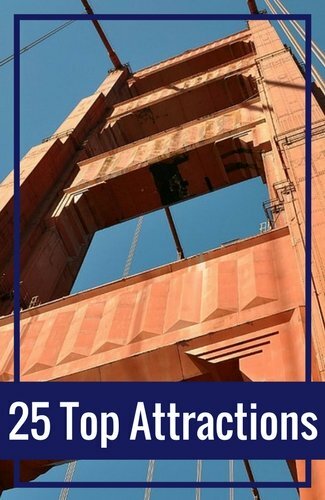 If you want to learn more about the movies that featured Alamo Square and all of SF, then check out the San Francisco Movie Sights Tour. 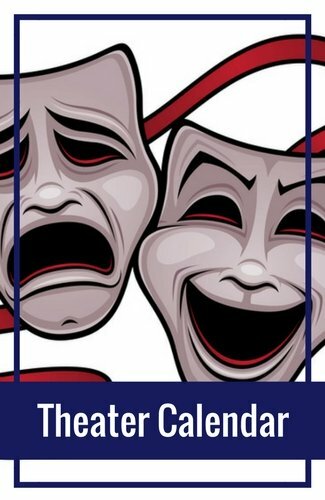 Visit GetYourGuide for ticketing availability or visit this page for an overview of my experience on this tour. 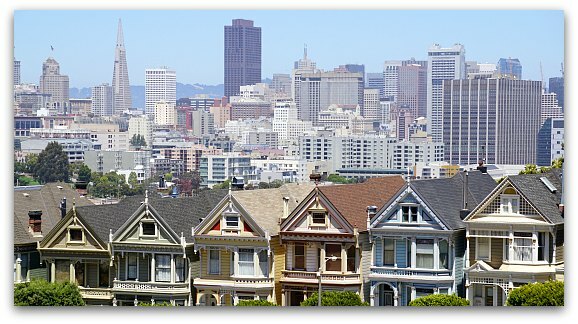 You will find the weather in Alamo Square San Francisco warmer than it is along the coasts. We have micro-climates in SF and the surrounding Bay Area, so you will find this area about 10 degrees warmer than what you experience along the windy shoreline. Here is an overview and what to expect each month. If you decide to skip the picnic lunch, there are several other great options just a few blocks from the Painted Ladies in San Francisco. Most of them are right on Divisadero Street, which is just two blocks west of the park. Bean Bag Cafe: This is one of my favorites because they have good food that isn't too expensive. The downside is that it is usually quite crowded. Here you can find some great salads, crepes, and cheap beers. It is right on the corner of Divisadero and Hayes Streets. Little Star Pizza: This is one of the best casual pizza places in San Francisco. It is open for lunch only on Friday, Saturday, and Sunday. However, they serve up dinner every night except Mondays. They also have a nice selection of beers and good salads. It is on Divisadero between McAllister and Fulton. 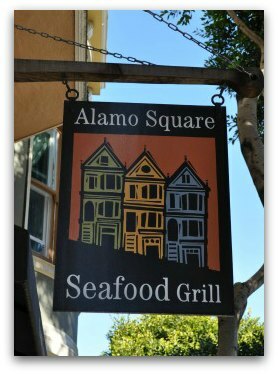 Alamo Square Seafood Grill: Locals love this quaint seafood restaurant, which only serves dinner. The focused menu and great prices keep people coming back for more. This neighborhood gem is on Fillmore Street between Fulton and Grove. Nopa: This is another great dinner option. Nopa is both a bar and restaurant on the corner of Divisadero and Hayes Streets. Here you can find dishes such as braised duck leg, pan roasted rainbow trout, or even Moroccan vegetable tagine. It's a little pricier than most of the other options, but their food is worth the trip. Don't forget to check out their excellent wine selection while you are there. 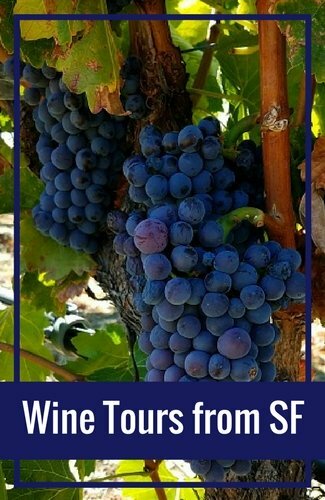 If you want to sample the best this district has to offer, then check out this fun food walking tour called NoPa-Alamo Square Gourmet Tour. This small group walking tour lasts for 3-hours and offer you the chance to step inside some of the famous eateries along the Divisadero. You will sample homemade ice cream, sustainable fish tacos, gourmet California cheeses, and shaves snow with tasty Asian flavors. Find out more about this tour on Viator. 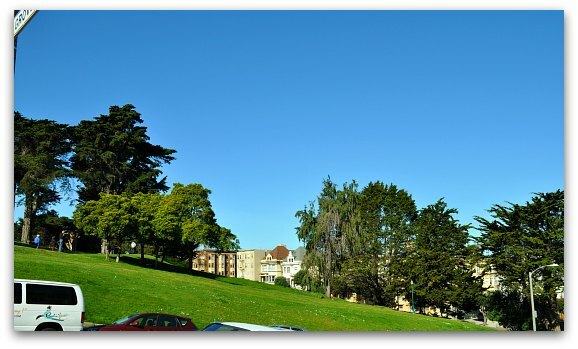 Alamo Square is a calm, quiet San Francisco neighborhood. If you love mixing with locals, this is a great area to stay in. It's not as centrally located as Union Square, but there are plenty of public transportation options that will easily take you to other neighborhoods. There are no large hotels or hotel chains in this neighborhood. Instead, you will find several small, locally owned hotels and bed and breakfast options. The following are some of my top picks. Chateau Tivoli was originally built in 1892 as a single family home for the lumber baron DB Jackson. Many eclectic San Franciscans have inhabited this historic home, including Ernestine Kreling, the owner of the Tivoli Opera House, and Bob Kaufman, a poet that inspired the term "Beatnik." The house was fully restored in the 1980s and has been a bed and breakfast since 1997. 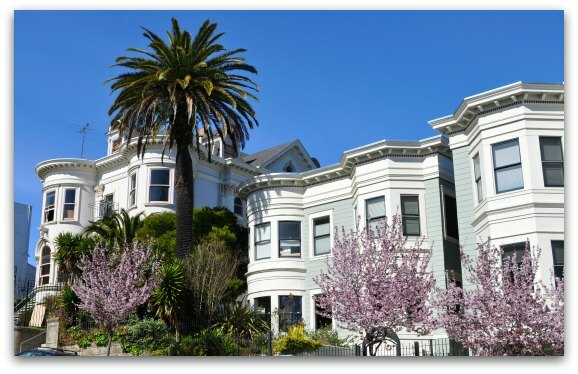 Its antique decor and romantic appeal make it one of the most popular bed and breakfasts in Alamo Square. They have free wireless internet, desks in all the rooms, and a library. Of course, breakfast is included, as is the evening wine and cheese reception. It's the perfect retreat away from the busy streets of San Francisco. You can choose from nine rooms that range from $120 to $300 a night. This is a small 24-room hotel. It sits right on Divisadero Street, which is home to many restaurants, bars, and shops. Rooms available range from small double rooms to those with two queen beds. They include free Wifi and flat screen TVs. This clean and comfortable hotel also offers a private garden for its guests. 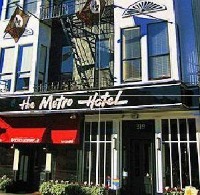 The hotel is close to public transit for easy access to Union Square, the Castro, and the Haight-Ashbury district. You will find exceptional value with this hotel. Rooms start at around $88 a night. Find additional reviews and great prices for The Metro Hotel on TripAdvisor. Find reviews and competitive prices for these and other great hotels on TripAdvisor. Here are some general options to get to Alamo Square San Francisco. Bus: There are two Muni buses that will get you quickly from Union Square this neighborhood. The best option is the 21-Hayes. The 21-Hayes stops on the southern side of the park. Get off the bus at the Hayes and Pierce Street stop. The other option is the 5-Fulton, which drops you off one block north of the park. Get off the bus at the McAllister and Pierce stop and walk up the hill on McAllister Street to get to the park. Taxi: Taking a taxi is another option. From Union Square, it will cost around $15. From Fisherman's Wharf, it will cost a little more. Expect to pay around $20 or more for a cab from this part of town. Find tips for taking taxis in the city. Here are a few more details instructions to get to other top attractions and districts from Alamo Square San Francisco. To Fisherman's Wharf: The best way to get from Alamo Square to Fisherman's Wharf is to pick up the 21 at Hayes and Steiner. Take it to the corner of Grove and Van Ness. Walk up Van Ness one block and pick up the 47 at Van Ness & McAllister. This will take you all the way to Fisherman's Wharf. You can ask the bus driver which stop is best for you based on where you are headed. To Union Square: Take the 21 from Hayes and Steiner all the way to Market & 4th. You will find Union Square just a couple of blocks away. To Haight Ashbury: Pick up the 21 heading west to Golden Gate Park. Take this to the corner of Hayes and Clayton. Once you get off the bus, walk across the panhandle of Golden Gate Park and about three blocks to get to the Haight. To Dolores Park: Walk to Fillmore and Grove and pick up the 22. Take this to the corner of Church and 16th. Walk up Church Street to 2 blocks to enter Dolores Park. To Golden Gate Bridge: Pick up the 22 at Fillmore and Grove. 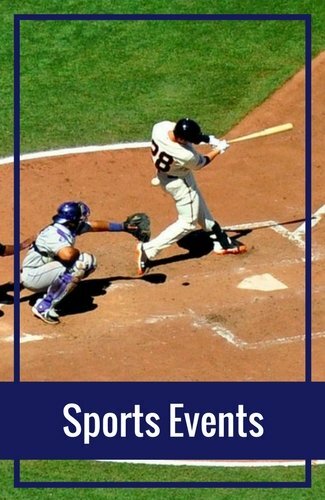 Take this to the corner of Fillmore and Lombard Street. Walk to the bus stop on Lombard Street in front of the Honda Service Station. Pick up the 28 and take it to the Golden Gate Bridge. To Golden Gate Park: Walk to McAllister and Pierce and pick up the 5 bus to Golden Gate Park. Take this to the stop at Fulton & 8th for attractions on the eastern end of the park. Take it to Fulton & 46th for attractions on the western end of the park and Ocean Beach. To/From BART: The closest BART Station is at the Civic Center Plaza. You will pick up the 21 to and from this station to get to Alamo Square San Francisco.